The biceps brachii muscle consists of two heads -- the long head and the short head. The long head is also referred to as the outer head of the biceps muscle on the outside of your upper arm. Train your biceps once or twice a week, resting at least 48 hours between workouts, using a combination of compound and isolation exercises to target the outer head of the biceps. Barbell curls are the meat and potatoes of biceps development. They are a compound exercise that target the entire biceps area. Changing your grip width to slightly less than shoulder-width apart on the barbell can place more emphasis on the outer head, says Frederic Delavier, author of "Strength Training Anatomy." Perform barbell curls first in your workout by completing three working sets and one warmup set. 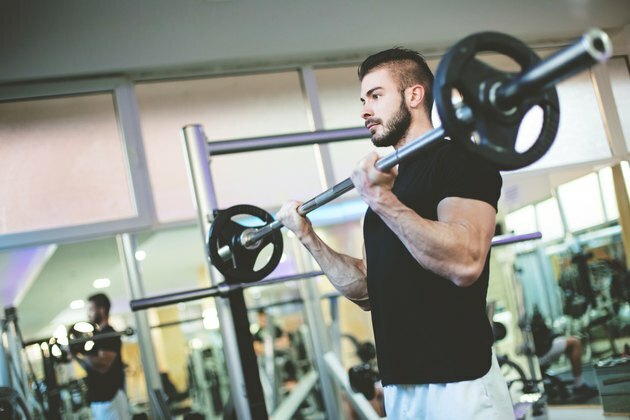 Complete 10 to 12 reps using a light weight for your warmup set, and select a weight in which muscle fatigue is reached between six and eight repetitions for your working sets. Hammer curls are performed similarly to dumbbell curls except that the dumbbells are gripped with the palms facing one another throughout the movement. The outer head is isolated during this exercise by allowing the elbows to move slightly forward and holding the contraction for a moment. Additionally, hammer curls can be performed by alternating arms or performing them across the body to hit the outer biceps more. Perform three sets of eight to 12 repetitions of hammer curls. Standing reverse curls or reverse preacher bench curls will development the outer head of the biceps and the forearms. Grip the bar slightly wider than shoulder width with an overhand grip, tucking your elbows at your side and keeping them there throughout the entire movement. Raise the bar to your shoulders, and squeeze at the top of the movement before lowering to starting position. Repeat this exercise for three sets of eight to 12 repetitions. Finish your workout with one-arm dumbbell preacher curls to isolate the outer head. Range of motion is essential during this exercise to allow maximum muscle stimulation throughout the biceps. Focus on each repetition, completing it in its full range of motion and squeezing the muscle at the top of the movement to get the biceps to grow. Complete three sets of 12 to 15 repetitions on each arm. Additionally, keep your rest time minimal by only resting while you are working the other arm.